Ready for an old school throwdown? The remaining members of evil disco metal heavyweights Static-X intend on honouring the legacy of their classic breakout album, Wisconsin Death Trip, by reuniting the original line-up and performing music from the album. Joining Static-X will be the prince of horror punk Wednesday 13 and industrial-esque, hard rocking veterans Dope. 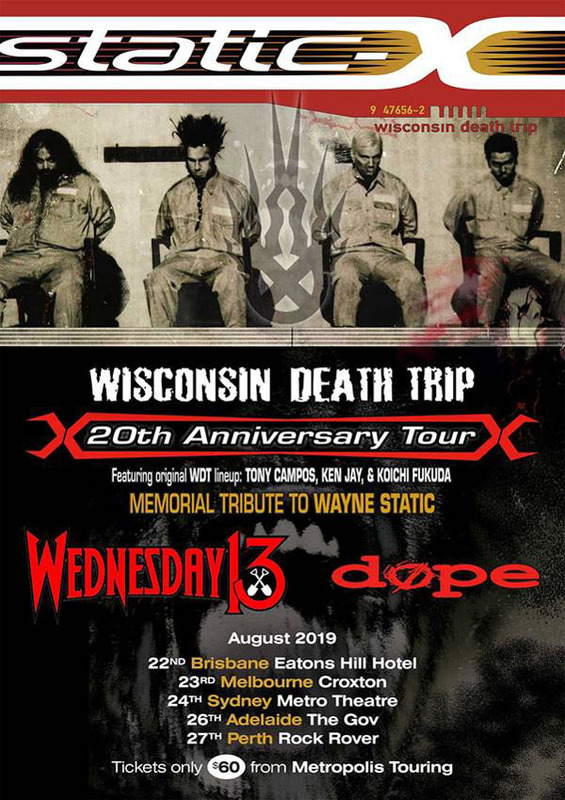 Bassist Tony Campos, drummer Ken Jay and guitarist Koichi Fukuda will also use the Wisconsin Death Trip Tour as a way to honour late frontman Wayne Static. Campos says, "Our intention is to pay ultimate respect to Wayne and to celebrate the music that has been in all of our hearts for more than 20 years. It's all about channelling the vibe from 1999 to the best of our ability and playing those classic Static-X songs live and loud with the fans"
A grimly glamorous ghoul who first slithered from the cobwebbed shadows of Charlotte, North Carolina, in the early 90s, Wednesday 13 has firmly established himself as the world's premier purveyor of balls-out horror punk insanity. An uncompromising New York City-based outfit that draws from both heavy metal and industrial music, Dope's confrontational emissions evoke Ministry, Skinny Puppy, and White Zombie. Emerging in 1999 the group continues to beat the post-industrial, while managing to weave in elements of speed, alternative, rap, and nu-metal. Tickets are $60 - Three international bands for the price of one!